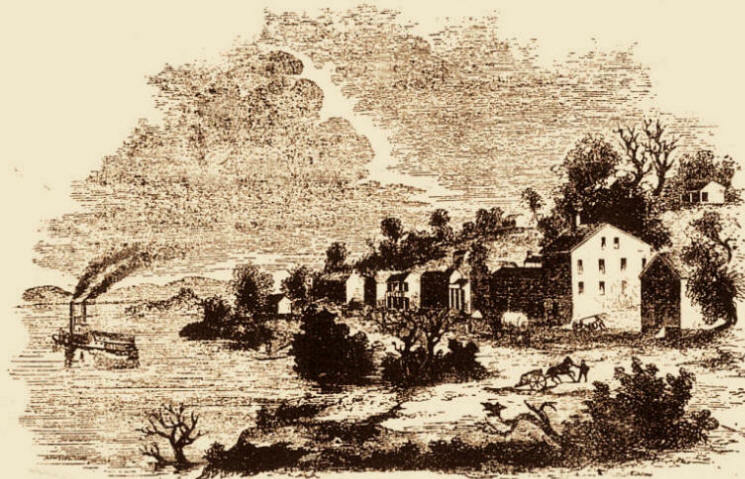 The representation below of the city of Kanzas, was drawn for Ballou's Magazine by Mr. Kilburn, the view being taken on the spot, and executed with his accustomed fidelity. The city is in Jackson county, Missouri, and is located on the south bank of the Missouri River, one hundred and thirty miles from Jefferson city. It is a place of considerable business, and embraces all the elements of future greatness. We present it as it appears to-day, but the cities of the West grow out of all recognition in a very few years. In the old world, the view of a town taken to-day would exhibit few changes from one a century old -- the little settlements on the Rhine, for instance, are quite stationary -- while rapid expansion and perpetual improvement are the features of our settlements, particularly in the great West, which is dotted here and there with faces of life and business, often a marvel even to us in New England, with whom progress and extension are watchwords.